What would Frances Perkins do? NEWCASTLE — What is the purpose of the federal Department of Labor? What sort of person is appropriate to serve as labor secretary? 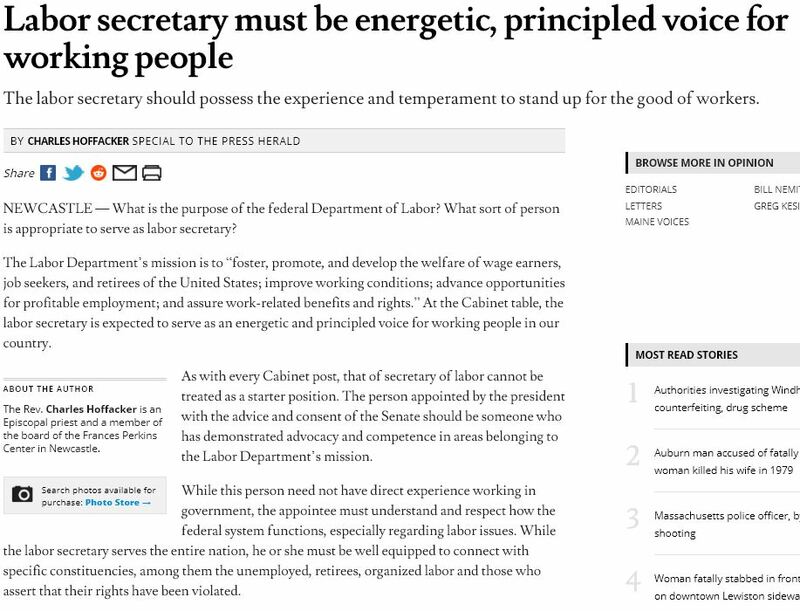 The Labor Department’s mission is to “foster, promote, and develop the welfare of wage earners, job seekers, and retirees of the United States; improve working conditions; advance opportunities for profitable employment; and assure work-related benefits and rights.” At the Cabinet table, the labor secretary is expected to serve as an energetic and principled voice for working people in our country. As with every Cabinet post, that of secretary of labor cannot be treated as a starter position. The person appointed by the president with the advice and consent of the Senate should be someone who has demonstrated advocacy and competence in areas belonging to the Labor Department’s mission. While this person need not have direct experience working in government, the appointee must understand and respect how the federal system functions, especially regarding labor issues. While the labor secretary serves the entire nation, he or she must be well equipped to connect with specific constituencies, among them the unemployed, retirees, organized labor and those who assert that their rights have been violated. None of this is partisan politics. It is how our federal government is designed to function. The Cabinet official charged with looking out for the interests of workers should be eminently well equipped to do so, both by experience and temperament. The working people of the United States deserve nothing less than a stellar secretary of labor who consistently promotes both their good and that of the nation. On Dec. 1, 1944, Frances Perkins addressed a letter to FDR in which she cited her abiding commitment to making the conditions of work and life for wage earners “less hard and dreary, more in keeping with the humane civilization of our country.” She went on to review the many labor initiatives of the Roosevelt administration, including those that addressed unemployment compensation, Social Security, the minimum wage, maximum hours and the Conciliation Service for labor disputes. This order Perkins mentions is one where the nation as market does not overshadow the nation as humane community. This order reflects the belief that our free society exists to advance the welfare of all our people. Opportunities for corporations to prosper must serve the common good, not simply private profit. 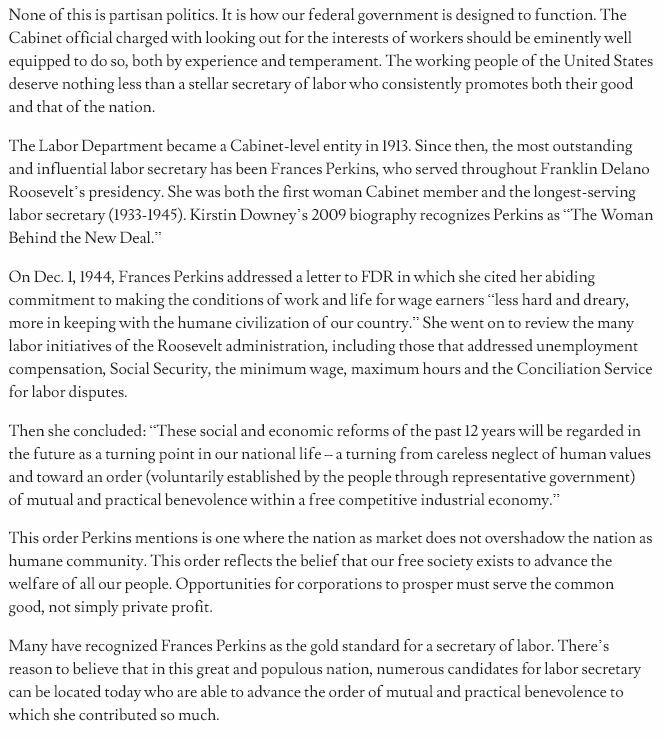 Many have recognized Frances Perkins as the gold standard for a secretary of labor. There’s reason to believe that in this great and populous nation, numerous candidates for labor secretary can be located today who are able to advance the order of mutual and practical benevolence to which she contributed so much. 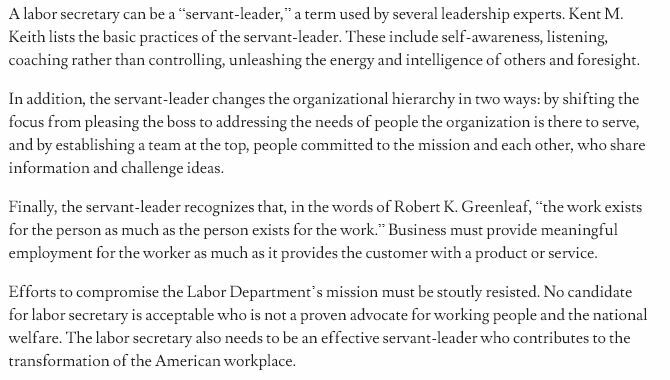 A labor secretary can be a “servant-leader,” a term used by several leadership experts. Kent M. Keith lists the basic practices of the servant-leader. These include self-awareness, listening, coaching rather than controlling, unleashing the energy and intelligence of others and foresight. In addition, the servant-leader changes the organizational hierarchy in two ways: by shifting the focus from pleasing the boss to addressing the needs of people the organization is there to serve, and by establishing a team at the top, people committed to the mission and each other, who share information and challenge ideas. Finally, the servant-leader recognizes that, in the words of Robert K. Greenleaf, “the work exists for the person as much as the person exists for the work.” Business must provide meaningful employment for the worker as much as it provides the customer with a product or service. Efforts to compromise the Labor Department’s mission must be stoutly resisted. No candidate for labor secretary is acceptable who is not a proven advocate for working people and the national welfare. The labor secretary also needs to be an effective servant-leader who contributes to the transformation of the American workplace. © 2018 Frances Perkins Center. All rights reserved.